Making chocolate is fun and easy with The Chocolate Doctor! Kerry Beal brings you a collection of professionally produced videos that lead you through the process of tempering, molding, and finishing beautiful chocolate products in a "learn at your own pace" collection of DVDs. All 3 DVDs valued at $89.97, NOW just $75 including FREE shipping. Volume 1 - The Basics of Successful Tempering - Instructional Video on DVD. Volume 2 - Techniques of Chocolate Molding - Instructional Video on DVD. A professionally produced, 30 minute Instructional Video on DVD demonstrates the use of tempered chocolate to make plates of individual chocolates, double plates of chocolates, hollow and solid molded figures. It also shows molding with a magnetic mold, using a transfer sheet to produce a chocolate with a coloured cocoa butter pattern on the top. A professionally produced, 25 minute Instructional Video on DVD demonstrates coating truffles, hand and fork dipping of items, making chocolate curls, ruffles, cigars and ribbons. 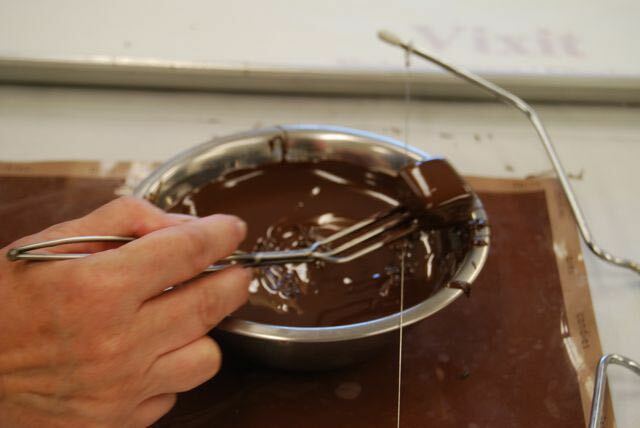 Also demonstrated is writing and making filigree decorations with tempered chocolate as well as making a freeform cup called a 'snobinette' into which you can pipe your centers or mousse. Finally with the remaining tempered chocolate we produce chocolate bark or clusters. Custom made stainless dipping fork. Heavy duty - beautifully balanced - dishwasher safe. Ships flat in an envelope - I will e-mail instructions on how to bend the tines to suit.